Our hardscape experts are ready to help homeowners and business owners in White Marsh design their new patio. Whether you live in Baltimore City, White Marsh, or anywhere in Maryland for that matter, curb appeal will always play an important role determining the value of your home. In fact, improving your home’s curb appeal can increase your home’s value by as much as 15-20%. And on top of that, curb appeal also helps your home sell faster. You see, despite your mother always telling you to never judge a book by its cover, that is exactly what we as human beings do day in and day out. We are naturally drawn to what we find aesthetically pleasing. 85% of homebuyers will view your home online before even thinking about visiting your home in person. Homebuyers make up their mind as to whether or not they will buy a home 30 Seconds after they first see it. So you have to ask yourself a very important question. “Does my home’s curb appeal stack up?” If you answered no, or think you could do better, now is the time to act. A few simple and affordable home improvement projects are all it takes to transform your home from ordinary to extraordinary. Nicolock is a 100% U.S. owned and operated company specializing in the production of patio pavers: interlocking concrete paving stones, architectural paving slabs, and precast concrete products. Made using Nicolock’s patented Paver-Shield™ technology, these patio pavers will continue to look great long after they have been installed. 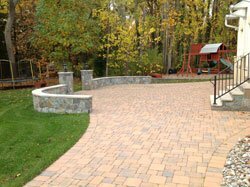 Because the color is throughout the full thickness of the paver, the color will not fade over time. Nicolock paving slabs are beautiful and very cost-effective options. Because every Nicolock hardscape product is made from natural materials, they can be recycled. All Nicolock products come with a limited lifetime warranty. With an average return on investment (ROI) over 80%, according to Remodeling Magazine’s annual Cost vs. Value report, a new patio is an excellent way to boost your home value. This entry was posted on Wednesday, July 1st, 2015	at 12:07 pm	. Both comments and pings are currently closed.